Welcome to another Brewery Reviewery, here at Enuffa.com! I love beer and I love going to the places where they make the beer. And then I like to write about the places where they make the beer that I love. 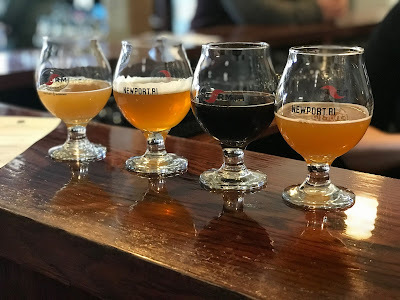 This past weekend on our annual trip to Newport, RI I headed over to one of the first breweries I'd ever visited, Newport Storm! Newport Storm (which now falls under the combined banner of Newport Craft Brewing & Distilling Co.) was founded in 1999 by a group of friends who had all majored in chemistry, and for years served as the state's only brewery. They eventually expanded into distilled spirits as well, now offering whiskey, rum, gin, amaro and moonshine. Their tasting room offers all that, plus a variety of their signature beers, as well as guided (or self-guided) tours around the facility. 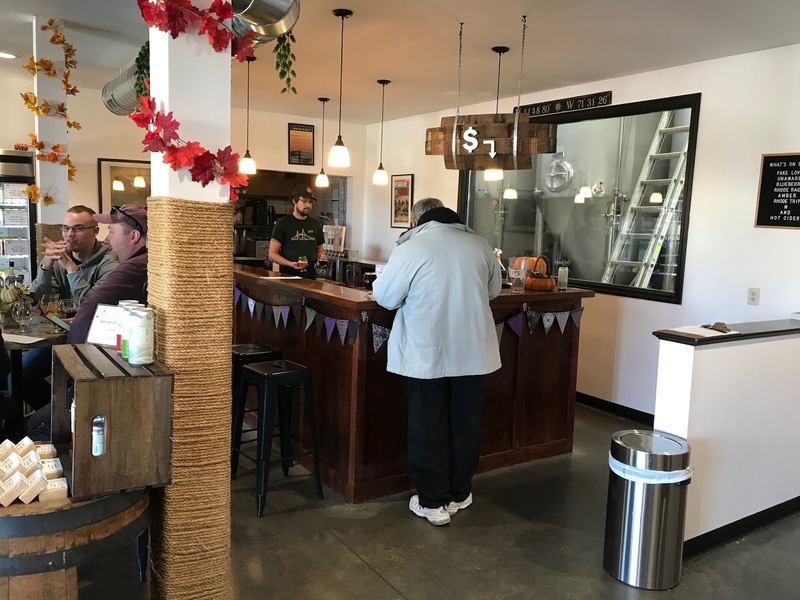 The tasting room was always an inviting spot, and recent updates like improved seating and board games have made it even cozier. I'm not a spirits guy, so I went with a beer flight; of the six options on tap a flight includes four 4 oz. 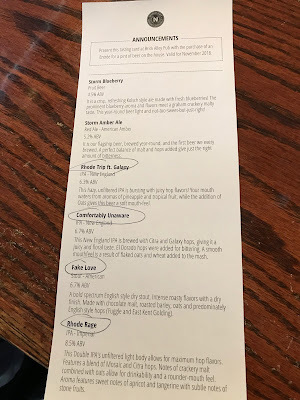 pours for nine bucks, plus if you hold onto your tasting card and present it at Brick Alley Restaurant & Pub (an ever-popular Newport spot) they'll give you a Newport Storm beer on the house with the purchase of an entree. Can't go wrong there. This hazy, unfiltered IPA is bursting with juicy hop flavors! Your mouth waters from aromas of pineapple and tropical fruit, while the addition of oats gives this beer a soft mouthfeel. J: This one was super cloudy and boasted a thick hops taste without giving way to bitterness like so many IPAs tend to do. It was juicy and mouthwatering, with hints of citrus. I'm not an IPA guy but I liked this one a lot. This New England IPA is brewed with Citra and Galaxy hops, giving it a juicy and floral taste. El Dorado hops were added for bittering. A smooth mouthfeel is a result of flaked oats and wheat added to the mash. J: Very different from the Rhode Trip, this was more crisp and lighter, with some prominent floral notes. A nice contrast from the previous IPA. A bold spectrum English style dry stout. Intense roasty flavors with a dry finish. Made with chocolate malt, roasted barley, oats and predominately English style hops (Fuggle and East Kent Golding). J: This was one of the frontrunners for the day, with DEEP coffee aromas and an unusually dry finish without sacrificing any richness. This brings to mind a dark, roasted cup o' joe, with a hint of hoppiness. This Double IPA's unfiltered light body allows for maximum hop flavors. Features a blend of Mosaic and Citra hops. Notes of crackery malt combined with oats allow for drinkability and a rounder mouthfeel. Aroma features sweet notes of apricot and tangerine with subtle notes of stone fruits. J: This one is more bitter than the other two IPAs but has a very light touch and subtle aromas. Probably my least favorite but not too shabby at all. We’ve been big fans of local ice cream legends, Frosty Freez, since before we began brewing in 1999. It was a natural idea to collaborate with the family who owns it as the company has been serving Aquidneck Island families ice cream for over 50 years now. The Frosty Freez crew generously shared the crucial ingredient — their vanilla soft serve blend – while we dialed it up with some cocoa nibs from Ghanna. Our Frosty Stout is their famous Vanilla-Chocolate twist turned into a creamy, delicious stout. J: The vanilla ice cream contrast with the cacao nibs for a lovely vanilla-chocolate balance. This stout is creamy and super smooth, like a great dessert. It is a crisp, refreshing Kolsch style ale made with fresh blueberries! The prominent blueberry aroma and flavors meet a grapham crackery malty tast. This year-round beer is light and not too sweet, but just right! J: For years I hated the idea of a blueberry beer. That is, until I tried Newport Storm's version. This refreshing offering has subtle blueberry sourness that doesn't overpower the crisp maltiness, and is good regardless of the season. I've since become a fan of blueberry beers, but Newport Storm's take is at the top of that particular heap. It is our flagship beer, brewed year-round, and the first beer we ever brewed. A perfect balance of malt and hops added give just the right amount of bitterness. J: The Amber is just a basic, easy-drinking session ale. Light but malty, not unlike a Sam Adams Boston Ale. Newport Storm is a brewery I can visit every time I'm in the area; they always bring back the flagship beers but also offer something new with every visit. Their pricing is super affordable, the atmosphere is casual and relaxing, and if you find something you really like, you can grab a four-pack to go. This place gets an easy thumbs up.